I've brought you a few posts on FI (financial independence) and kids (such as our visits to a local art museum). I think it is important for me to supplement their (my kids) education outside of their school / classroom. Once we reach FIRE (financial independence retire early) it may be even more important for me to supplement their education (depending on where we go / what we choose to do for their education). And related to the previous bullet point ... depending on where we go once we reach FIRE (Spain, anyone? ), I may choose to supplement their education even more (prep my own curriculum / World School?). Once we reach FIRE, I may not work in the traditional sense, but I will probably be "working" in the non-traditional sense! I will continue to bring you ways to do activities at home (and away from home) with your kids that are free, cheap, or fit within variable spending as you journey on your way to financial independence too! One of my goals this year is to try to incorporate more science and history at home with my kids since there is less time for that in the public school setting. 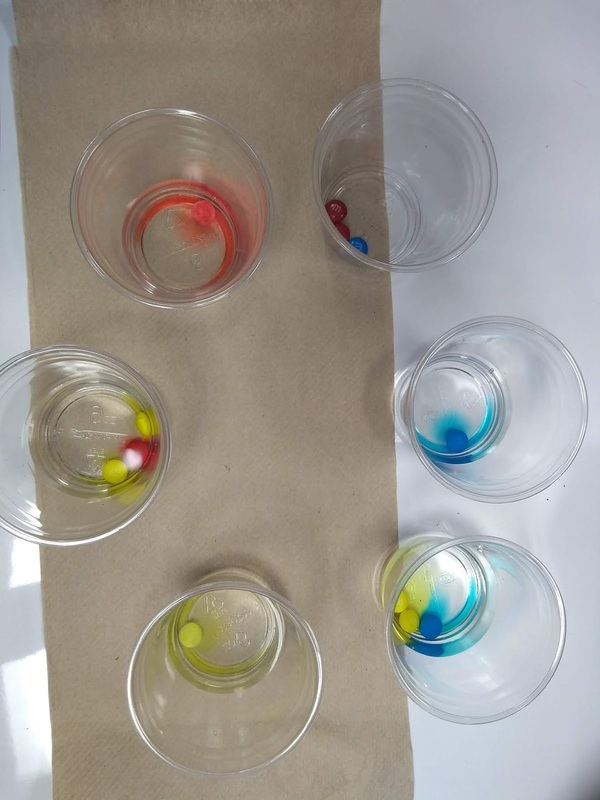 This is an easy and inexpensive science / art activity that you can do at home (or in the classroom if you are an educator!). I actually did this experiment at school with all of my classes since we were (and are) recently focused on the color wheel / Rodeo Art. Not only am I trying to incorporate more science at home, but I am trying to incorporate more science into my art classroom. 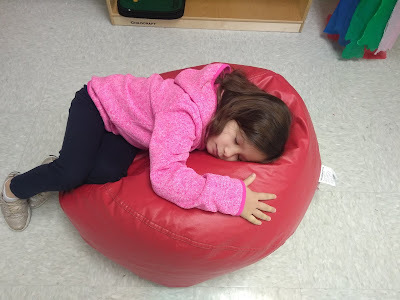 I bought less than $10 worth of supplies at a local grocery store (HEB), and I did the science experiment as a Do First activity with all of my classes (Kinder - 4th Grade; 6 days worth of classes). Package of Plastic Cups (if you are doing this at home the same glasses or plastic cups should work). (You need six total or more depending on how big you want your color wheel to be). 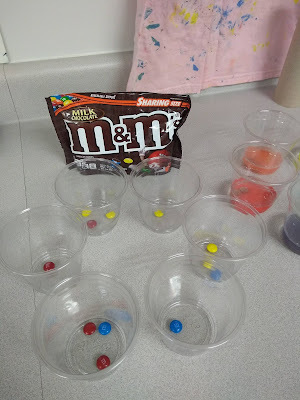 One bag (or more depending on how many times you are doing the experiment) of regular M&Ms. You only need to use red, yellow, and blue (primary colors!) M&Ms. 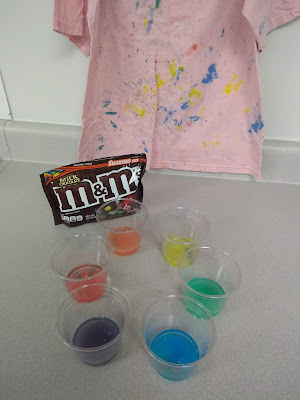 I used the primary color M&Ms only to show how the primary colors mix to make the secondary colors. We set up a basic color wheel. Step 1: Set out 6 plastic cups in a circle. Step 2: What are the primary colors? 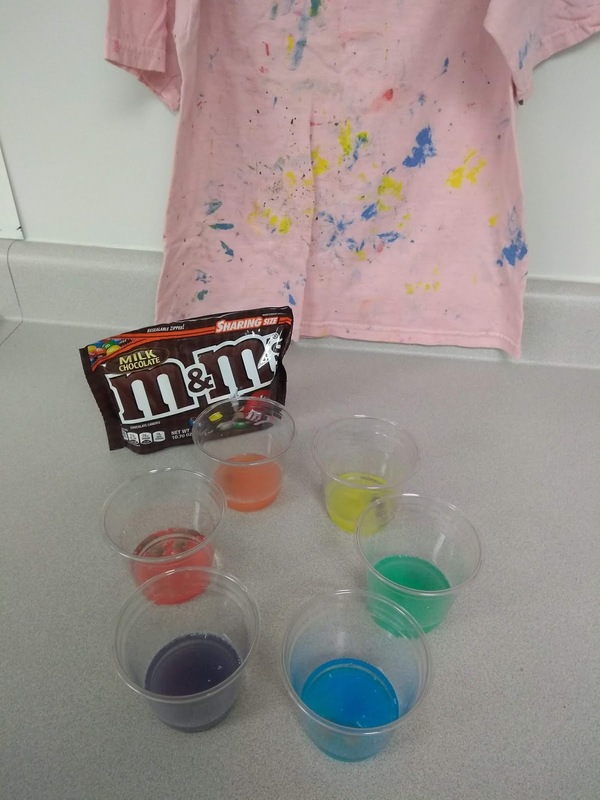 Put a red, yellow, and blue M&M into one cup each (in a triangle shape). Step 3: Red and yellow mix to make what color? Put a red and yellow M&M together between the cups that have red and yellow M&Ms. Answer: Orange. Step 4: Yellow and blue mix to make what color? Put a yellow and blue M&M together between the cups that have yellow and blue M&Ms. Answer: Green. Step 5: Red and blue mix to make what color? Put a red and blue M&M together between the cups that have red and blue M&Ms. Answer: Violet or purple. Note, we found that sometimes adding two red M&Ms with one blue made our violet / purple color turn out better. It is an experiment!! Step 6: Add a small amount of water to each cup so that the M&Ms are covered. I personally didn't measure, but I tried to make the water part somewhat equal. It didn't matter in my case the temperature of the water. Step 7: Watch to see how the colors mix together! I would also pick up the secondary colors (the ones that mix to make orange, green, and violet / purple) and move the cup in a circular motion to watch how the colors mix together. Next, I talked to my classes about the - primary colors, secondary colors, warm colors (red, orange, yellow), and cool colors (blue, green, violet / purple). We also talked about complementary colors (colors opposite on the color wheel), and I finally poured the complementary colors together. 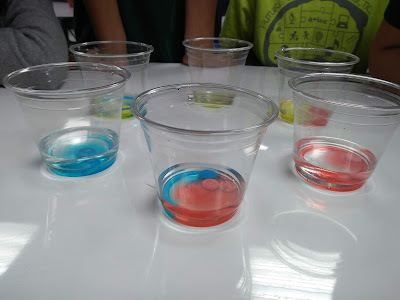 My students loved this experiment! Not only was the experiment fun (lots of oohs and aahs), but it was easy and low cost. 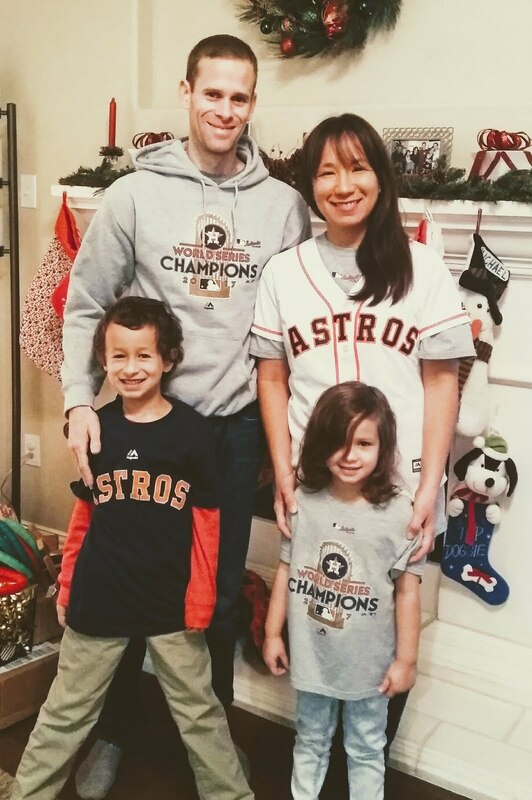 What are other ways you incorporate science at home with your kids (or at school)? Is The 4% Withdrawal Rate Safe? Can You Reduce Your Spending?